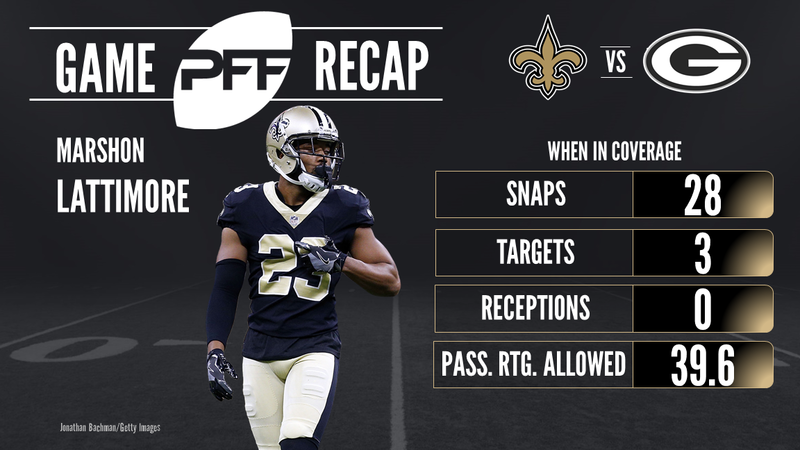 Through seven weeks of the season, PFF has never given a higher overall grade to a rookie cornerback than the 94.1 the New Orleans Saints standout CB Marshon Lattimore currently has. We saw 54 intriguing snaps from Lattimore in the preseason, but so far his regular season performance has looked little short of spectacular for a Saints team that was crying out for a legit No. 1 corner. Lattimore has been thrown at 22 times, allowing 12 receptions for just 114 yards over the first seven weeks of the season (and five games for him). He has yet to surrender a touchdown catch, and has an interception and four pass breakups. Throwing his way is currently yielding a passer rating of just 50.2, just over 10.0 points higher than if quarterbacks simply threw the ball away every snap instead. This past week against the Packers he was thrown at three times and had two pass breakups, while likely being spared a third only by the receiver dropping it a split second before he chopped down his arms on a receiver screen. Lattimore has played almost exclusively at right cornerback for the Saints, with 79.8 percent of his snaps on the right side of the defense, but 27 of the 41 snaps he’s spent on the other side came this past weekend against the Packers. This past week hints at more to come for the Saints rookie, because it was the first time this season the team felt comfortable enough to move their cornerbacks around and track receivers. Against the Packers, Lattimore was on Devante Adams all game, while Ken Crawley took Jordy Nelson. The numbers are obviously skewed by Brett Hundley being the quarterback and not Aaron Rodgers, but the strategy worked emphatically. Nelson caught just one pass for 13 yards against Crawley, while Adams caught just two passes for eight yards, neither of which came against Lattimore, but against safeties when he worked over the middle of the field. Rookie cornerbacks are not supposed to hit the ground running in the NFL, even those with special talent. As a rookie, Darrelle Revis ended his year with an overall PFF grade of 82.6, before going on a seven-year run where he averaged 90.5 and then seeing his play fall off a cliff the final two seasons of his career. Lattimore is on track for a grade that Revis only eclipsed once in his career – his sensational 2009 season which may be the best season of cornerback coverage we have seen over the past decade. 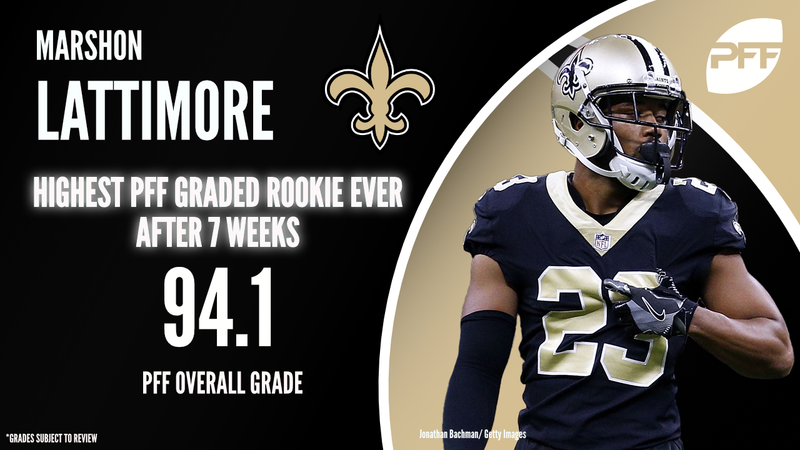 He doesn’t just have the highest grade we have ever seen from a rookie cornerback at this point in the season, Lattimore has the highest grade we have seen from a rookie at ANY position through seven weeks of his debut season. Top flight cornerbacks can transform a defense, and the Saints defense has been in need of transformation for years now. If he can sustain anything like this level of play we could be looking at the next great shutdown cornerback, and the player that transforms this defense.